Take Me To Texas is a collection of twelve short stories that recall the Texas of an earlier time. Beginning with the cowboy life at the turn of the century, Take Me To Texas encompasses romantic recollections of young love, retells old family yarns, and relates coming-of-age incidents not to be forgotten. 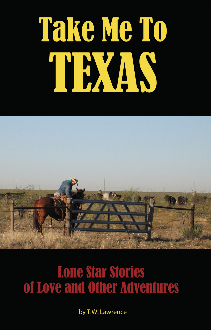 All of the stories touch Texas either through their setting or in their characters. And although fictive, each narrative rings true to life.